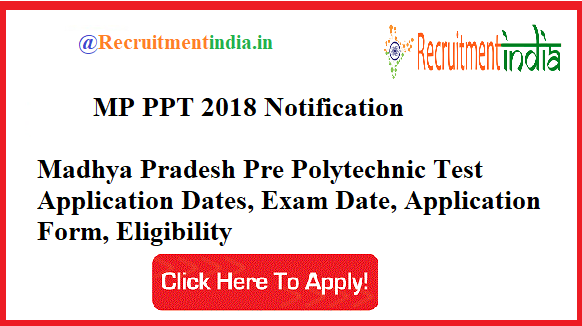 In Madhya Pradesh for Polytechnic courses admissions, the entrance exam notification 2018 is released. Check MP PPT 2018 Notification released by the Madhya Pradesh Professional Examination Board (MPPEB) board. This is the MP Pre Polytechnic exam for giving admission in various diploma courses. The application dates are 12th March to 26th March 2018 and link obtain @ peb.mponline.gov.in / www.vyapam.nic.in. Check MP Pre Polytechnic Test 2018 Notification if you are the aspirant who are wishing to join in the diploma courses across the Madhya Pradesh state. In MP state, giving seats for the diploma branches will be based on the scores in this admission exam. This admission exam is going to conduct on 8th April 2018. For that 8th April 2018 exam, before the candidates has to submit the application form in the specified dates of notification. By the closing day of 26th March 2018, they have to give their entirely filled application form in online. Any entrance exam update is available @ Recruitmentindia.in. Fill MP PPT Online Application Form. The students who had got the SSC / 10th class in science passed certificate are eligible to appear for this written exam. After completion of this diploma course, they can get the chance of employment on the basis of this course qualification. So many students are showing a lot of interest in this course because of the employment chances avail through this courses. The Professional Examination Board of Madhya Pradesh (MP PEB) which is popularly called as MP Vyapam propagates this notification. For more details scroll this page. No Age Limit for this exam. Mode of Payment: The candidates can pay the application fee in the following ways given below. In that page See the Notification / Fee Particulars Option. The pdf of MP PPT 2018 Notification will be opened. Later Click the Application Form. Enter Proper Details and Upload Photo, sign. At peb.mponline.gov.in MP PPT Form 2018 are present. First of all refer the complete information brochure of this notification. Remember the key points of this notification like what are the conditions, when the closing of application form will be done, where the application form can be submitted, application fees details etc. Later note down the important dates on which date exam is planning, hall ticket is releasing etc are tabulated very clearly at the bottom table. This MP PPT 2018 Notification also gives the hint of this PPT entrance examination pattern saying that the duration of exam is 3 hours. The sections of the exam paper are Maths, Physics and Chemistry. The question paper standards is 10th base. So all the postulants who are seeking admissions in polytechnic courses in MP state can prepare for this exam according to their 10th class academics. 1 week earlier to the exam date, this MP PPT admit card will be released.